Meet the senior class at Parkdale High School, 1935. I suppose they went on to be Tom Brokaw's "Greatest Generation," growing up in the Depression and becoming adults during World War II. Please fill in any details you have on the lives of these seniors. Fiorettli was actually known as Chuck and farmed along the Cooper Spur Road up above Parkdale. He was married to Esther Denham. Their son Rick was in my class at Wy'east. He passed away in 2002. Wally A. Hutson died in 1996 was was married to Nadine Smith. They also farmed above Parkdale off the Cooper Spur Road. They had a son in my class in school. Sometimes, you just have to be careful about trying to make connections. The Parrot name was an early Oregon and Klickitat County pioneer name. I tried to make a connection. Both Claude and Vera, along with their parents George and Leota are buried in Idlewilde. Klickitat County George Parrot was born half a century earlier, in a different state and buried in Goldendale, WA. Members of this class were born between 1915 and 1919. Several of the boys were born in 1915, indicating they probably missed some school to help on the farm. I think June Bedsant should be June Bedsaul. Other alternate names are Harvey Ernest Williams, Wallace Allen Hutson, Edna Marcia Steinhauser Russell, Marjorie Patricia Reilly Cornett, John Walters, Donna Shake Priest, Virginia Laurance Cushman, Helen Claria Rumbaugh Holmes. 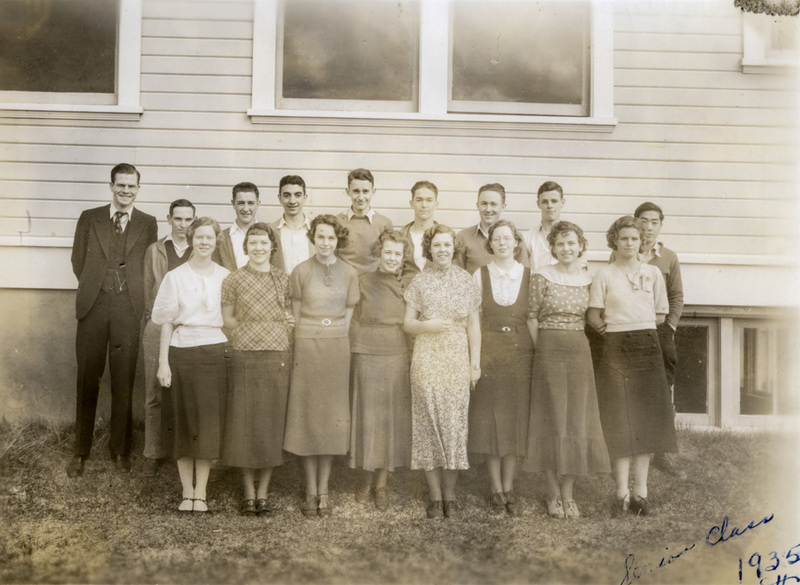 Several of these students are listed in the "History of Hood River County 1852 - 1982 or 1987." I would quote from the books, but the Hood River County Historical Society holds the copyright. I can provide page numbers if desired. Family is discussing the birth of a child on the side of the road in March 1920. The flu epidemic caused a slow departure from Parkdale on March 18 for Gifford Mills Uptegrove and his wife Mabel Ellen Starbird. With a midwife in the vehicle, the trip to Hood River was begun. Somewhere along the road William Edgar Uptegrove was born during a light snow fall. Mabel gave birth to William on top of the seat from the backseat of the vehicle on the side of the road. This birth is in stark contrast to the birth of Gifford and Mabel's first child who was born in Portland one street from the railroad station. The train station is now a historic landmark and the Coe maternity center is no longer in operation. Please tell me whether there was help in Hood River by 1920 or if they somehow hoped to get a train to Portland.